This page features some "short reports" from various minor climbs I did while I was attending university in California, before I got more heavily involved in climbing. These reports do not give a wide photo selection like most of my climbing reports, but they do provide some route beta and interesting details. While I was going to school in California, my university's alpine club arranged a mountaineering workshop involving a climb of Casaval Ridge on Shasta. Unfortunately the weather prevented us from getting further than our camp at 10,000 ft. Two weeks later I convinced a few friends to go back and try to summit on Casaval Ridge, but again bad weather stopped us, this time at about 13,000 ft. Two weeks after that, I was back again, this time for a successful summit via Green Butte/Sergeant's Ridge. There were whiteout conditions for the last half of the climb, but I was determined to make the summit this time. Sergeant's Ridge was a nice route, lacking the crowds of the popular Avalanche Gulch. I climbed this with a friend on the 15th day of a 21-day hike of the John Muir Trail. It was a pretty easy climb up a relatively solid talus field. It took a bit less than 2 hours, and then we hiked down and hiked 15 miles to our next campsite. I "climbed" (really, it was just a hike the way we went) this at the end of our 21-day hike of the John Muir Trail. We woke up at 2am and climbed under a full moon, reaching the summit just in time to make some tea, dive into our sleeping bags, and watch the sunrise. The hike up was all on a trail, and there were lots of people, but it is worth doing for the very fact that it is the tallest peak in the lower 48 states. During my undergraduate years, my friend and I led a trip for the outdoors club involving a climb of Mt. Ritter, which was about 5-6 hours drive away. I had seen Mt. Ritter while hiking the John Muir Trail, and had made a note to come back and climb it. Ten people ended up coming on the trip. The mountain involved some tricky route finding (at least I found it tricky at the time, but I didn't have the experience I have now), but we had good weather and conditions. There was some steep icy snow that we probably should not have been leading beginners up, and half of our party ended up turning around (with my friend leading them back down), while I continued to the top with a few others. We reached the top around 9am (we started at 4:30am). We then descended, packed up camp, hiked out to the cars, and drove back to school, arriving a few hours before our Monday classes began. Me climbing Pitch 1 of Braille Book. In June 2017, I again climbed Braille Book, during a 2-week trip to the Valley where I climbed several classic routes (click link for trip report). <-- Photo of Braille Book I took when climbing the NE Buttress of Higher Cathedral Rock in 2016. 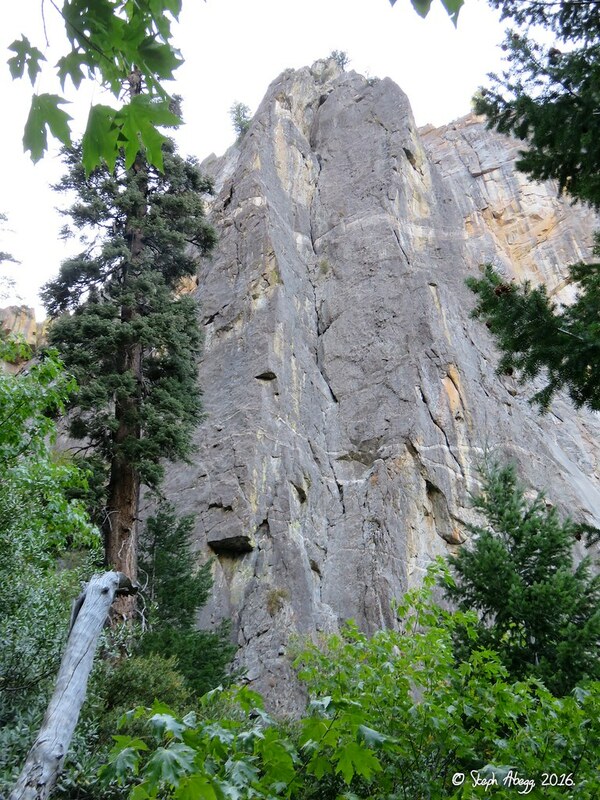 Braille Book climbs the obvious open book for 700' of awesome 5.8(+) climbing. 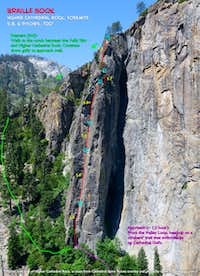 <-- Route Overlay of Braille Book when I climbed the route again in June 2017. For Thanksgiving break for my final year as an undergraduate, I headed to the mountains. A small group of us went to the Treasure Lakes area (near Bishop, CA) to do some winter mountaineering. One of the peaks I climbed while I was there was Rosy Finch. We had set out to climb Pyramid Peak, but due to a declination error on our compass and incorrect assumptions, we found ourselves on the icy and loose 4th class north ridge of Rosy Finch. Paul wisely decided to stop about half way up, and I continued to the summit without incident. Really nice route overlay of the 16-pitch Royal Arches route (as well as Serenity Crack and Sons of Yesterday). By Mark Thomas. 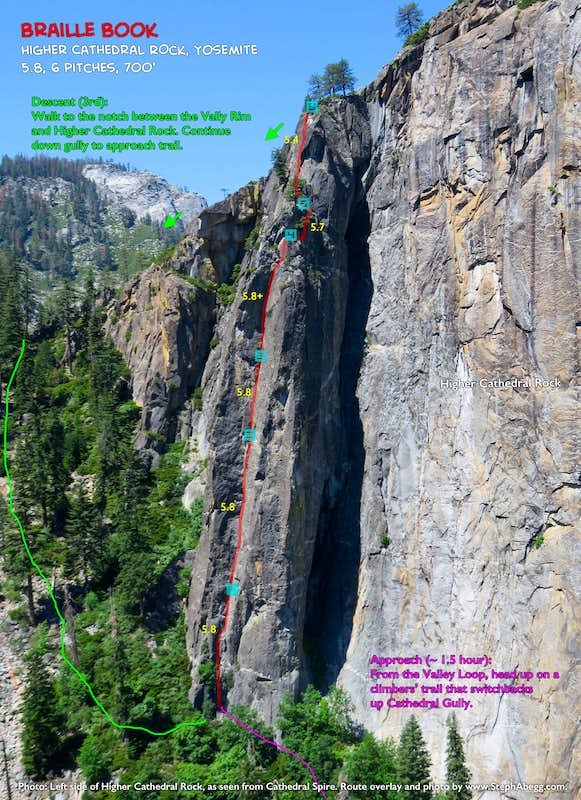 Before I graduated from university at the end of December 2005, I wanted to do one last multi-pitch Yosemite classic. My friend and I planned on Snakedike on Half Dome, but it was too snowy, so we decided instead to do the 16-pitch classic Royal Arches. We started early so we wouldn't feel pressured for time on the initial chimney pitch, which was a bit tricky and wet. After this the route was great, the weather was warm, and there were none of the usual crowds (December is the best time to climb in the Valley!). We reached the top in about 5 hours, and rappelled down the route in 3 hours.